Flipped Classrooms and Slam Dunks” – Bring your A-game! Home > Flipped Classrooms and Slam Dunks” – Bring your A-game! 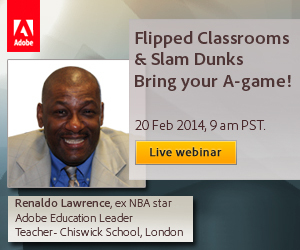 Renaldo Lawrence, is an ex NBA player and now a senior teacher at Chiswick School, London. With close to 15 years of experience as an Advanced Skills Educator with multiple schools, Renaldo brings his rich experience in Education to the table and adds tremendous value to the community as an Adobe Education Leader. Join Renaldo in this webinar presented by Adobe to learn all about Flipped Classrooms, Student Assessment technologies and Learner Intervention and Collaboration – all done without programming in a few clicks. Click here  to download the accompanying slide deck.